Mill City Apartments has been recognized among the 2018 Elite 1% of properties in the nation for online reputation by J Turner Research. The Elite 1% ORA™ Power Ranking is an annual ranking developed by J Turner Research based on a monthly online reputation research of over 101,000 apartments, across 19+ review sites and Internet Listing Services (ILS). J Turner Research is an independent market research and online reputation management company exclusively serving the multifamily industry. In 2018, 1,234 apartments made it to the ORA™ (Online Reputation Assessment) score of 89 and have at least 12 online reviews to be included in this ranking. For properties with the same ORA™ score, the property with the higher number of reviews ranked higher. Mill City Apartments scored a 91. The national average is 61.56. The ORA score serves as the industry standard to measure or benchmark a property or company’s online reputation. The ORA™ score, based on a scale of 0-100, is an aggregate compilation of an apartment’s ratings across 19+ review sites and ILSs. 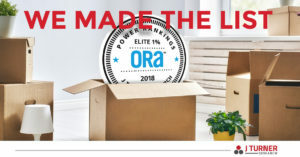 The annual Elite 1% ranking is part of the ORA™ Power Ranking series published by Multifamily Executive (MFE). Each month, MFE features a ranking of properties and management companies based on their ORA ™ scores. A property or management company does not have to be a J Turner Research client to qualify for this ranking. To learn more about ORA ™, please visit www.jturnerresearch.com/about/what-is-ora-score.